Happy April. Still pretty chilly, but I can offer some hope: My cats are shedding like crazy, so the cold weather is almost behind us. It’s been quite a week. My friends and I have seen three plays over eight days and all of them provided fascinating, funny, and/or thought-provoking evenings in the theatre. 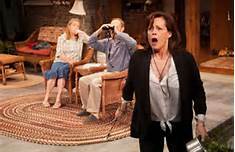 I’ll go chronologically and start with Christopher Durang’s new play on Broadway: Vanya and Sonia and Masha and Spike at The Golden Theatre. Naturally I have a gripe: When will audiences stop applauding just because a movie or television star shows up on the stage? It’s their job to show up. OK, I’m over it. Until next time. In Vanya and Sonia and Masha and Spike, Durang speaks to the discomfort of growing older in times unfriendly to society’s elders. The first three named characters of the title are doing just that — the last won’t age for quite some time, and that contrast is telling. Happily, it tells in a very funny manner. The scene is a charming rural home in Bucks County. Two 50-something siblings, Vanya (David Hyde Pierce) and Sonia (Kristine Nielsen), don’t do much of anything these days in the family home, which is paid for by their sister Masha, a Movie Star. Their professor parents named the children (even the adopted daughter Sonia) after characters in Chekhov plays. Vanya and Sonia and Masha and Spike is Durang’s mash-up of Chekhov plays in modern times with mod.cons.,* and just as my friend Horvendile predicted, it gets funnier and funnier, hits its pathos of sad and romantic and sweet, and ends (relatively) happily. The first twenty minutes notwithstanding, this old broad found the play delightful and recommends it despite being uncertain about the Chekhovian themes — I recognized and enjoyed them (probably not all), but cannot be sure if these were extra layers for people who got them, or if the Chekhovian novices won’t get the play at all. I would hope and wish all theatregoers get the Chekhov, but hope is pretty slim (pickings) in the 21st century. Mr. Durang pushes his assumptions a bit more: The house cleaner is named Cassandra, and she comes in with a buzzing energy warning everyone of bad things to come connected with various words or names of unknown persons, sometimes sounds that don’t resolve themselves into names until later. Shalita Grant is a whirlwind, funny if often incomprehensible in the role. Masha the Movie Star (Sigourney Weaver) has been advised by her young assistant (who is not a financial advisor) to sell the parental home where Vanya and Sonia have lived their entire lives, much of which was devoted to caring for their aging and demented parents. Masha was off making the money to pay for the care of the parents, the house, and her otherwise unemployed siblings. She suffered no hardship doing so — she’s a movie star, after all. Masha is, dare I say it, aging and not getting cast in the juicy roles (with their associated pay levels) as she used to, so she worries about her future like anyone of her age. Apparently the reason for her visit is to tell her siblings that they’re going to have to find somewhere else to live. What ensues is an emotional roller coaster of a houseparty filled with odd and discordant creatures together for the weekend. Happily one evening is devoted to a costume party being held by a neighbor down the street. Vanya and Sonia, who live there full time, do not know this neighbor, but Masha the Movie Star was invited, and she’s arranged costumes for her siblings that support her own choice — to go as Snow White, with her handsome boy toy Spike dressed as her Prince Charming. Masha, in constant need of reassurance, insists her siblings go as her dwarves. Vanya of course acquiesces, but this is too much for Sonia to bear, and she goes to get her own costume. She agrees to go as the wicked queen. Ah, but which wicked queen? The scene is set for Ms. Nielsen's Sonia to do one helluva Maggie Smith impression, and wear a fabulous dress. Director Martin let Ms. Nielsen live her character in relation to Ms. Weaver’s character and Mr. Hyde Pierce’s for the rest of the play. Ms. Nielsen is splendid, regal, adorable, and hilarious. Unfortunately Ms. Weaver is not in the same class as the actors playing her siblings. She tries very hard, but this is not her medium. In some ways, you’d think Mr. Durang wrote this role for her, it seems to fit her so well. But no matter her history with the playwright, she lacks absurdist skills on stage. Mr. Hyde Pierce’s naturalism is a great foil for his sisters, but he and Ms. Nielsen show up Ms. Weaver without even trying. Christopher Durang is writing for his own generation and we appreciate his voice. It is, after all, our voice. Just funnier. When Mr. Hyde Pierce’s calm and calming demeanor cracks, he speaks with thousands of voices about our lost comforts and our discomfort with the ease and speed and shallowness of those mod.cons. Once this play starts moving, it runs, it glides, it flies, it bounces and barely rests for laughs. Billy Magnusson’s Spike is endlessly hilarious as the hunk of a Boy Toy who accompanies Masha back to the old homestead. Spike likes to touch people intimately, he likes to take off his clothes, he likes to talk, and he can multitask on his smartphone, and he almost got called back for a part in the sequel to Entourage. He is very fit. He really likes stripping. When Masha wants him to put his clothes back on because she’s jealous of Nina (you remember Nina, a sweet young thing visiting her aunt and uncle next door, played quirkily by Genevieve Angelson), she advises him to do a reverse strip. Which he does rather literally, to everyone’s consternation — except Vanya, who sits down to enjoy the show. It’s funny, during an evening in costume for a party, the siblings disguised as other people (or fictional characters) come closer to the truth of who they are than they do when dressed as themselves. Next morning, we get a play within a play, the truth will out, and Vanya’s magnificent rant that is totally comprehensible to people of a certain age. I felt his pain item by item. And who knew about Tommy Kirk! Important to note is that I understood every word he said despite his rage and railing, but did not understand about half of what Shalita Grant as Cassandra said. I hope she learns from him. Naturally we end up listening to the Beatles with the siblings, which makes everybody happy. Other technical matters: I want to live in David Korins’s beautiful warm set. I would and/or have lived in the perfect costumes by Emily Rebholz, and the lighting design by Justin Townsend was just right. It must be noted that we continued laughing even after the play was over as we fought our way out of the theatre onto the very crowded street. Sweet. The only thing wrong with Vanya and Sonia and Masha and Spike is that Kristine Nielsen’s name comes after the title instead of above it. *Mod.cons is an old real estate term in ads for residences, meaning "modern conveniences." That originally meant things like running hot water, a bathroom inside the apartment as opposed to down the hall and shared with strangers. Now it means smartphones and PDAs and tweets and constant yet meaningless communication and multi-tasking. ~ Molly Matera, logging off. I have more theatre to tell you about, but I need to sleep on those reviews.